Star Wars: X-Wing Wave 7 Expansion Packs arrive on Wednesday, August 26th! Star Wars: X-Wing Wave 7 will be at The Wandering Dragon on Wednesday, August 26th! SLAM into the middle of your enemy’s starfighters. Pummel your foes with plasma torpedoes and ion bombs. Eliminate everyone who would come between you and your bounty! 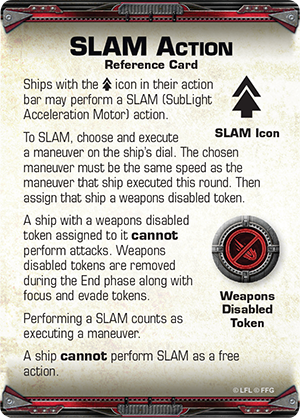 The game’s explosive seventh wave introduces new starships to each of the game’s three factions, including two for the Scum and Villainy faction and one each for the Rebels and Imperials. The four new starship expansions in X-Wing Wave VII give the Scum and Villainy faction another powerful large-base ship, the YV-666 light freighter, as well as the versatile Kihraxz assault fighter. Meanwhile, the Rebel Alliance and Imperial Navy both gain powerful new bombers and munitions, as well as upgrades that enhance the lethality of their existing arsenals. The Hound’s Tooth Expansion Pack brings this infamous freighter to life as a towering, large-base miniature starship for the Scum and Villainy faction, rendered at the game’s standard 1/270 scale. Naturally, as a skilled bounty hunter, Bossk ensured that there was plenty more to the Hound’s Tooth than first met the eye, and the Hound’s Tooth Expansion Pack also comes with four YV-666 ship cards and thirteen upgrades, including the Hound’s Tooth Title, which allows your YV-666 pilot to survive imminent destruction by escaping aboard the Nashtah Pup, a unique Z-95 Headhunter. The Hound’s Tooth Expansion Pack also comes with a ship card for theNashtah Pup, though to fly it, you’ll need the miniature starship from the Most Wanted Expansion Pack or Z-95 Headhunter Expansion Pack. The rules for deploying the Nashtah Pup are covered in the expansion’s rulesheet, which also introduces a new mission, Hunting the Hunter. The Kihraxz assault fighter was developed specifically for the Black Sun crime syndicate, whose highly paid ace pilots demanded a nimble, powerful ship to match their skills. Modeled after Incom’s popular X-wing starfighter, the versatile Kihraxz arrives to X-Wing as a well-rounded, small-base, Scum and Villainy starship with three attack, two agility, four hull, and one shield. You gain one of these miniature starfighters in the Kihraxz Fighter Expansion Pack, carefully pre-painted and sculpted at the game’s standard 1/270 scale. Additionally, the Kihraxz Fighter Expansion Pack comes with four ship cards, five upgrades, a maneuver dial, and all the tokens you need to fly this fighter into any battle in which the galaxy’s Scum have a vested interest. In X-Wing, as in Star Wars lore, the K-wing’s surprising acceleration, heavy armor plating, and devastating ordnance make it an outstanding ship for hit-and-run operations. One of the game’s most durable small-base fighters, the K-wing features four shields and five hull, along with a primary turret weapon with an attack value of “2.” On top of this, the ship comes with the new SLAM action, which allows it to race across the battlefield and deploy its bombs at an unprecedented speed. In addition to its pre-painted K-wing miniature, sculpted at 1/270 scale, the K-wing Expansion Pack comes with four ship cards and nine upgrades that feature a massive armament of new missiles, bombs, and torpedoes, as well the Extra Munitions upgrade, which dramatically improves the efficiency of your ordnance. 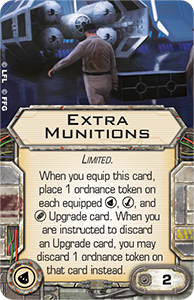 Like the K-wing Expansion Pack, the TIE Punisher Expansion Pack comes with the Extra Munitions upgrade, allowing you to make the most of your TIE punisher’s two torpedo slots, two missile slots, and two bomb slots. Even though you’re not likely to utilize all these slots, they offer you a tremendous measure of flexibility as you look for the ordnance that’s likely to best suit your squad. Not only can it carry a slightly larger payload than the TIE bomber, the TIE punisher invites Imperial players to perfect their bombing skills by taking advantage of both its innate boost action and its ability to equip a system upgrade like Advanced Sensors. With Advanced Sensors, the TIE punisher can boost into position to drop a bomb right in front of an enemy fighter, and then it can immediately perform its maneuver to fly away. Whether you hope to bolster your Scum fleet with the best talent that credits can buy, or you seek an advantage in the Galactic Civil War, the seventh wave of X-Wing starship expansions promises to give you plenty of new ways to hunt down your rivals, litter the battlefield with bombs, and race to victory past the detritus of exploded enemy starfighters. All four Wave VII expansion packs will be arriving at The Wandering Dragon on Wednesday, August 26th!